The demand for new housing is growing. In order to protect the natural attributes and liveability of our city, our green spaces, unique neighbourhoods and bushland setting we need to plan and manage how and where we grow. Our new housing has to be located efficiently to use existing infrastructure, services and networks. Our city needs to work now, and for future generations, balancing social needs with economic impacts and the environment as the city's footprint changes. Our urban area has increased by more than half since self government. Much of this growth has been in the form of single dwellings with fewer and fewer people living in them. The combination of these factors has meant our urban footprint is growing outwards, potentially challenging the sustainability and liveability of our city. Map 2: 2012-16 Approved residential development applications and building approvals. Click to view larger version. There is potential for approximately 29,000 new homes in existing greenfield areas. If no new greenfield areas are identified, this is sufficient until second half of 2030s. We understand that Canberrans value the unique bush and native grasslands environments that surround our city. We have heard clear feedback that people want to retain this natural buffer between the ACT and surrounding parts of New South Wales, which is why decisions about further greenfields development on Canberra's fringes will need to be carefully weighed up against protecting our natural environment. 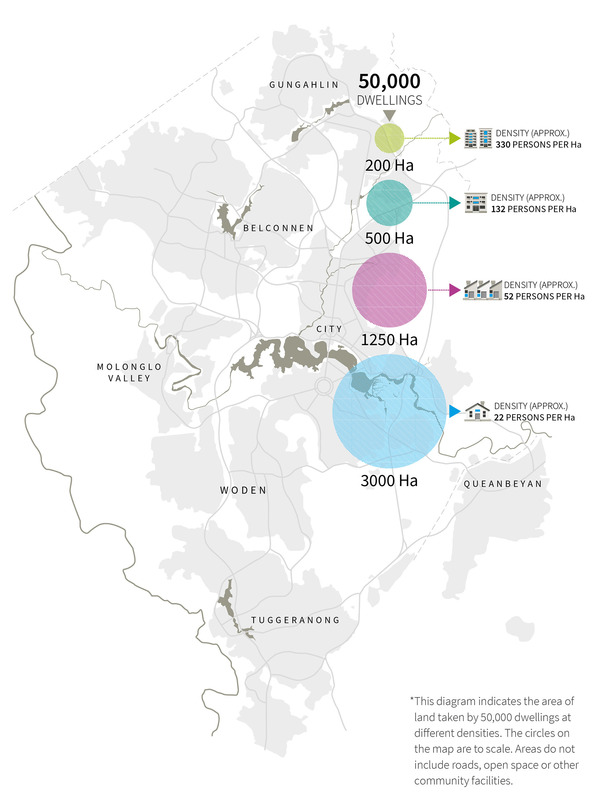 Most new greenfield development has occurred to the north and west of the city, leading to a growing distance between residential areas and Canberra's major employment locations in the centre and east. In order to meet sustainability and accessibility objectives, the location of future residential development including greenfield areas, redevelopment and urban infill will need to be carefully considered in order to minimise trip length and journey times. Map 3. Land taken by 50,000 dwellings at different densities. This diagram indicates the area of land taken by 50,000 dwellings at different densities. The circles on the map are to scale. Areas do not include roads, open space or other community facilities. Click to view larger version.